1. Anigrand Craftswork have released their 1:72 resin kit of the Sikorsky S-67 'Blackhawk' gunship, #AA-2022. From the photos this looks like another great kit from Anigrand. The prototype was over 23m long (figures vary!) so this is a big ship. An innovation that other manufacturers could do well to follow is the offer of additional vacform canopies and decals sheets at a nominal charge when ordered at the same time as the kit. 2. The 1:72 resin Rooivalk from Spinners (see HKN#184) is available now, made to order. For more details of how to get hold of it, contact Johan Van Tonder. 3. 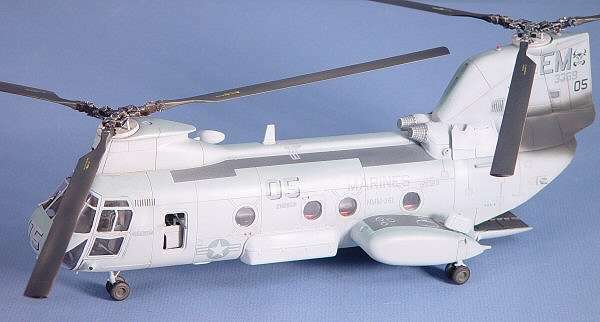 Academy's 1:48 CH-46E has been released, though supplies seem to be taking a little while to appear. Cybermodeler have got hold of a review sample, and have already published very comprehensive in-box and build reviews. Their conclusion is that it's a really excellent kit, even when built straight out of the box. 4. 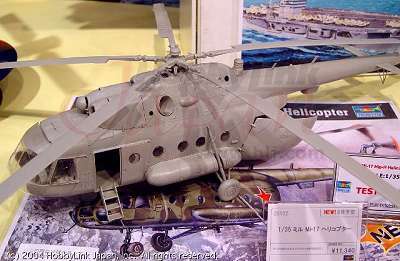 Trumpeter had a test-shot of their forthcoming 1:35 Mi-17 at the 2004 Shizuoka Hobby Show. It should be released in July. 5. Also due for release in July is Italeri's 1:72 UH-1D/H Huey Slick. Also included will be a Serb paramilitary (from Milosevic's private army), and a colourful Russian Navy Hind. 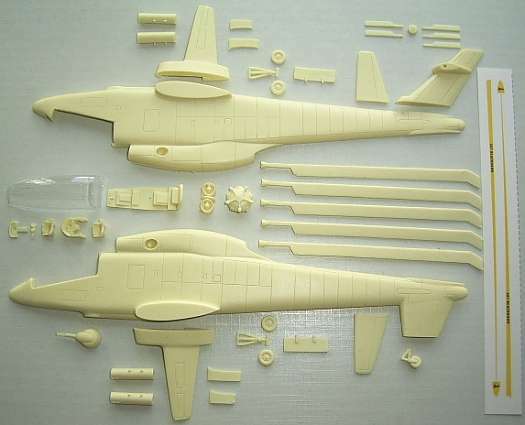 Linden Hill are also planning to release a separate sheet of stencilled airframe data for the Hind in 1:35 and possibly also 1:48 scale. 7. Due from the decal brand Toff will be a 1:35 scale Mi-24 sheet for the Hungarian AF, this too will be available through Linden Hill. The HuAF sheet will include both the old red star insignia and the post-1991 chevrons. The modern HuAF Mi-24 will include the new badge of the regiment at Szentkiralyszabadja (St. Cyril's Spa) which is prominently featured on the fuselage behind the cockpit. 8. Continuing the Hind theme, Eduard's June releases will include a set of wheel and canopy masks, #XL060, for the 1:35 Trumpeter kit. 9. 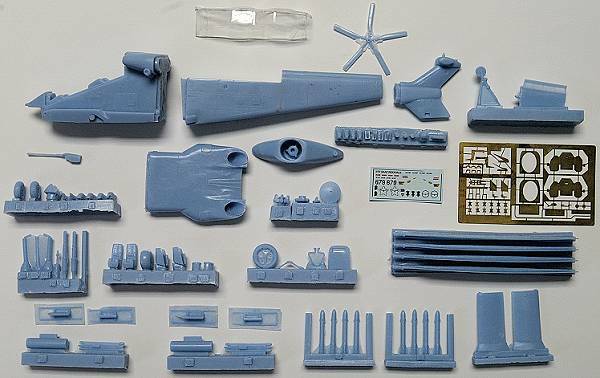 Meanwhile Czech Master Kits (CMK) will continue their series of extras for the 1:48 Trumpeter/Mini Hobby Model Hind, this time its a resin set containing 'revised parts, wheels, external fuel tanks, new armament' for the Mi-24V, set #4138. 10. 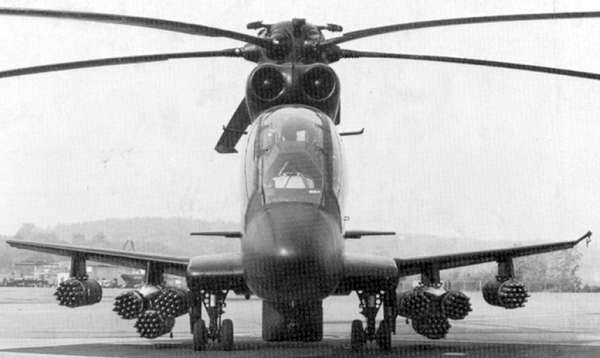 The next helicopter to get Squadron Signal's Walkaround treatment will be the 'UH-1 Huey Gunship'. Thanks to John Weideman (Spinners), Johan Van Tonder, Arnold Chiu (Anigrand Craftswork), Michael Benolkin (Cybermodeler), and Guy Holroyd (Linden Hill).